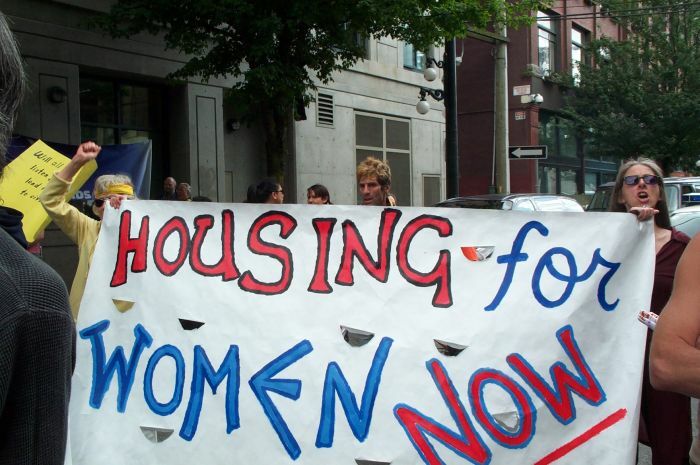 NEWS RELEASE about PovertyHousingGender posted on October 1, 2010 by Harsha W.
Why do women in the Downtown Eastside march every year for housing? October 1 2010, Vancouver, Coast Salish Territories- In response to the persistent violence of poverty and homelessness, women in the Power of Women Group of the Downtown Eastside Women’s Centre are organizing the “4th Annual March For Women’s Housing” to demand safe and long-term affordable housing. A report released by the Canadian Centre for Policy Alternatives and Social Planning and Research Council of BC earlier in September 2010 found that, according to BC Housing’s own service plans and data, there an overall net increase of only 280 new social housing units over the past five years. Over 1550 of the so-called “new” supportive housing units are actually renovations and replacements of existing housing stock rather than additional low-income housing.